As a school we have adopted the mastery approach to the curriculum and to curriculum delivery. This allows our children to succeed in modern society. The curriculum for every department is knowledge rich and emphasises the development and securing deep knowledge prior to the development of skills. Teachers and students alike, plan learning around carefully compiled Knowledge Organisers. Our curriculum is designed to provide a flexible, personalised education – knowing that one size does not fit all and preparing students for their future lives. Our vision for teaching and learning is upheld by staff and students alike. 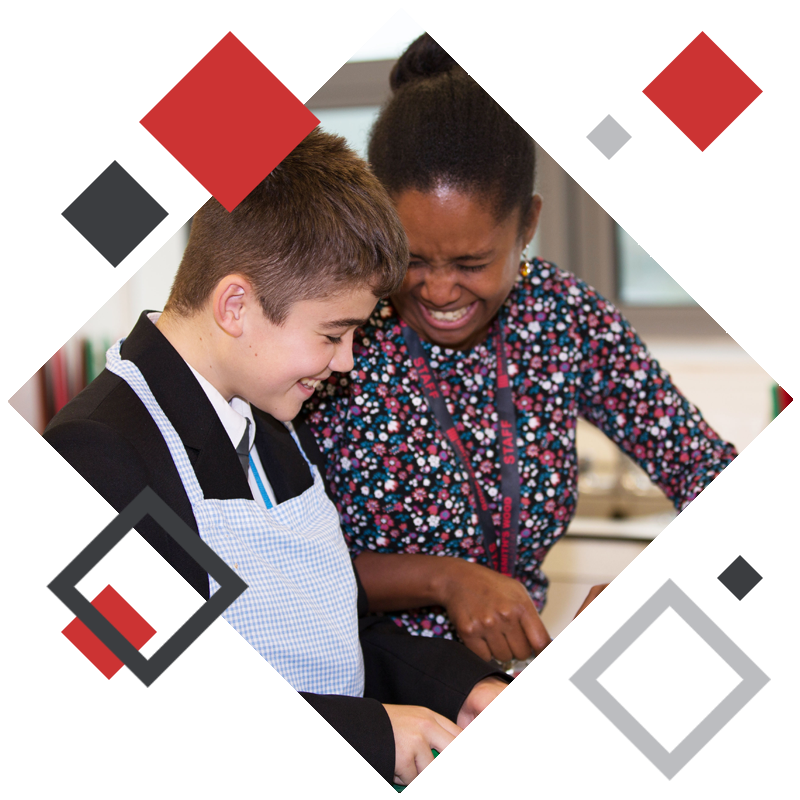 At Smith’s Wood Academy, we believe all students, whatever their background, are able to become experts in the disciplines that they study. Their expertise will be achieved through quality teaching and the dissemination of deep knowledge by highly skilled and knowledgeable subject experts. The Mastery approach to teaching will prevail – in every classroom, every lesson, every day. Our students have the right to be introduced to deep knowledge and a wealth of information from the spectrum of subjects that they study. They will be introduced to, and understand, theories and principles that have influenced, continue to influence, and will influence in the future, the world in which they live. They will be prepared to fully engage in academic discussion about their learning. has developed a rigorous approach to behaviour management which ensures that teachers can teach and students can learn at all times. An overview of the curriculum coverage for each subject area can be found via that subjects web page. If you would like to discuss curriculum coverage further please contact Mr Andrew Deen, Deputy Head of Academy. 2)  To aid thinking, that knowledge must be encoded in long-term memory. Retrieval practice is the tool that encodes knowledge in long term memory. Further research in the cognitive sciences makes clear that the battle against forgetting begins as soon as you learn something and that the best time to practice retrieving something from long-term memory is when you have started to forget it. When you try have to work harder to remember something, but then do so, you build a stronger neural pathway of the thing you are trying to remember (or not forget). Therefore in May 2017 we began the first tentative steps of our journey toward a knowledge based curriculum, and the mastery approach to teaching. Fast forward to September 2017 and we are well underway with the transformation – we have re-set our expectations around T&L, with a clear focus on what we are terming the ‘mastery’ approach. This approach ensures that lessons follow a very simple framework. DNA (Do Now Activity) – retrieval practice is the purpose of DNAs (to stem the forgetting). Explanation (modelling is key here) – the teacher (the expert) tells the students the key information they need to know/understand. Making sense (through questioning and further modelling/support) the students get their heads around the concept – and prove to the teacher that with support, they can grasp the knowledge. Deliberate practice – here students deliberately practice the knowledge, applying it toward a scenario/proving they really understand the concept. Feedback – the teacher is able to address misconceptions and check for clear understanding, while putting the onus on the students to correct their errors and improve their work. To support our delivery of this work we’ve put in place (and are continuing to do so) some very highly focused training on each of these aspects. Our approach to Feedback has also been transformed. See our policy here. At Smith’s Wood Academy we recognise that effective feedback is one of the most powerful tools in enhancing student achievement (Hattie in Ainsworth & Viegut 2006). As a result, all students have an entitlement to receive regular feedback. We understand the importance of teacher workload in relation to feedback, therefore the policy outlined below is underpinned by the following key principles of best practice as outlined by the Education Endowment Foundation (EEF). Feedback should redirect or refocus either the teacher’s or the learner’s actions to achieve a goal. Feedback should identify strengths within student’s work. Feedback must give a short term target for improvement (be able to be completed within a lesson). Attainment grades will only be given where relevant (end of unit assessments). Feedback at Smith’s Wood Academy therefore takes a number of forms. Live feedback and deep feedback. Teachers no longer mark a students’ book, instead the teacher spends time identifying errors made by students at point of error, addressing these immediately. While teachers will also read through a students’ work, making notes in a teacher notebook – to share success and areas for development with the class as a whole. The improvement we have seen within students books as a result of these changes has been incredible. To further support the students’ ability to encode key information into their long term memory we will be introducing a new homework policy after the October half term – we have named this new approach to homework ‘Study’. Study requires the students to spend up to 2 hours an evening working on knowledge recall by self-quizzing using a ‘Knowledge Organsier’, while also spending a proportion of this time reading for pleasure. All students will be expected to provide evidence of their nightly Study, and will be sanction for failure to Study, or provide evidence of this Study. For more information about the new programme, the documents that students will be provided with, and the expectations of the programme please see the Policy which can be found here. We believe that the Study programme will have a powerful effect upon the knowledge recall of our students, ensuring they are able to access the higher order thinking skills so crucial for educational success, both at Smith’s Wood Academy, but also beyond to College and University.